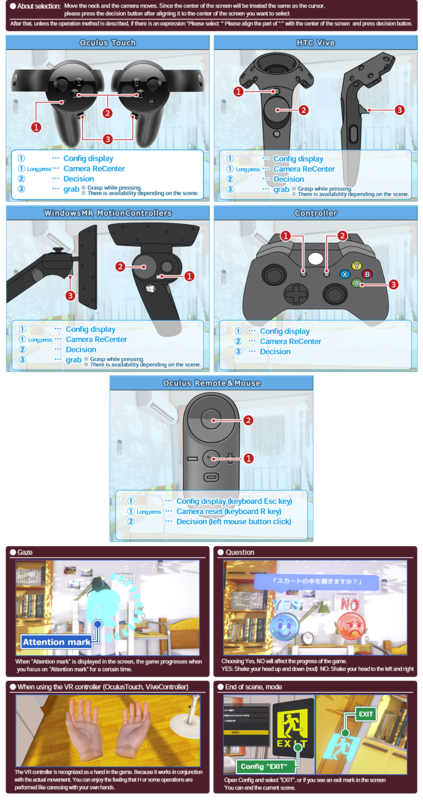 * When not using VR controller, please set "Basic setting" → "Use a VR controller" in " Config " to "Off". If you are playing the game you will get a stuck mode. * The operation guide can be switched between "Guide Display Settings " in " Config ". You can adjust the operation settings in the game, display and volume adjustment. * Some items will not appear unless some games are progressed. : When selected, the camera position is reset after 1 second. : The items you manipulated here will be reflected in the game. : Select to exit the current mode. : When using "Oculus Touch" "Vive Controller" please set it to "On". : You can switch the display of the guide displayed during the game. : You can switch the display of the man. : You can change the setting of the light. : You can switch the subtitle display and change the color. : It is possible to adjust the volume of BGM and sound etc. : You can set the quality in the game. : It is a setting that places no burden on the PC. : It is setting with speed emphasis. : It is an intermediate setting between speed and quality. : This is a setting focusing on quality. : It is setting for high specification. : You can set expression in the game. : Set the shadow's color and darkness. : Set the blurring by light. : Smooth the edge of the object. : You can switch colors. : Enable expression of sunlight through sunlight. : You can change the perspective and size in the game. * "Camera purse" "Camera scale" can only use Oculus Rift. Please install it with the resident program such as antivirus software stopped. Depending on the software that resides, it may not be able to install normally. Please also stop functions such as Windows Active Desktop. * Please start up "Startup.exe" by right click → run as administrator. · Symptom 2: Game does not start, suddenly stopped, behavior is wrong, etc. When the game does not operate properly, mostly it does not satisfy the operating environment. First of all, please confirm whether your computer meets the operating environment of the game. * Please follow the operation under your own responsibility. We will support as much as we can, but we are not responsible for accidents in introducing device drivers etc. We do not take any responsibility. If you are concerned about installing the driver and various operations, please consult your computer manufacturer. (1) Update the graphics card driver. There are cases where the version of the graphics card driver is old when there are abnormalities in operation when it meets the operating environment. For updating the graphics card driver please contact your computer manufacturer or your graphic card manufacturer. When resident programs such as antivirus software are running, it may not work properly, so please stop antivirus software etc. once the game starts. Please refer to the manual of the resident software about the method of stopping the resident program. It may be caused by a motherboard or sound card. Update each device driver to the latest version. * For details, please contact your computer maker, or the distributor of each hardware. There are cases where Windows is unstable. If you format the HDD after backing up and insert Windows again, it may return to normal. * Please be careful with backup carefully. Please note that our company can not assume the responsibility when important data is lost. * For details, please contact your personal computer maker, or Microsoft. Although most troubles are solved by the above method, please contact us by e-mail to "online support" if you have any questions.